Christians nationwide are vowing to “eat mor chikin” today in observation of Chick-fil-A Appreciation Day, an event that was organized to show support for the popular restaurant chain’s stand for Biblical marriage. According to the Support Chick-fil-A Facebook page, over 610, 000 people have pledged to patronize the eatery today with family and friends. The effort was spawned by television talk show host and former presidential candidate Mike Huckabee, who states that he became disturbed by all of the hateful remarks that he had been hearing against the company’s Christian beliefs. Huckabee says that he’s not asking anyone to make a speech or demonstrate outside of their local restaurant today, but he simply wants to encourage others to make their voice heard through their presence and their pocketbook. He also remarked that Christians should not be “chicken” about their values, but should always be ready to publicly stand for what they believe — and their rights to believe it. “We are a family-owned business, a family-led business, and we are married to our first wives. We give God thanks for that,” he added. According to the Washington Post, Cathy had also stated on a radio broadcast last month that he believed that the promotion of homosexual “marriage” was evoking the wrath of God upon America. Cathy’s comments have stirred much discussion on both sides of the issue. Hollywood celebrities have announced that they would be boycotting the restaurant, and mayors from Boston to San Francisco have warned Chick-Fil-A to keep out of their cities. However, others have shown an enormous outpouring of support for the company, vowing to patronize their local restaurant as much as possible. “I got a breakfast burrito. It was great!” wrote one supporter today. “We are heading there tonight,” wrote another. 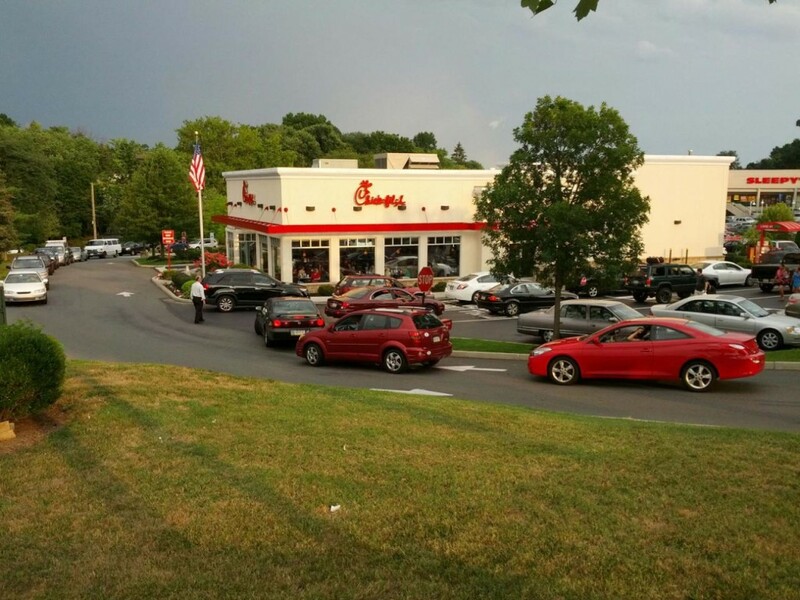 “God bless Chick-fil-A!” declared one woman. Congressmen and other national representatives have also been promoting today’s Chick-fil-A Appreciation Day to their constituents. On Friday, however, homosexuals plan to hold a “kiss-in” at Chick-fil-A locations nationwide as a means of demonstrating against the restaurant’s belief in Biblical marriage.